Rebecca Kiss/Assistant Photo Editor J.U.M.P. Nation discussed the “pink tax” with a group of roughly 30 students on Wednesday evening at the University Union. The discussion highlighted the difference in price between women’s and men’s products. Women’s products cost more than those of men 42 percent of the time, with women paying about $1,351 more a year in extra costs, according to statistics read at the Juvenile Urban Multicultural Program’s (JUMP Nation) “Pink Tax” discussion. The discussion, held on Wednesday evening, focused on the pink tax, a term that refers to the markup of women’s products in comparison to men’s products and is named after products that are identical to men’s products except for one difference — they’re pink. The pink tax can affect products from razors and deodorant to body wash and stool softeners. 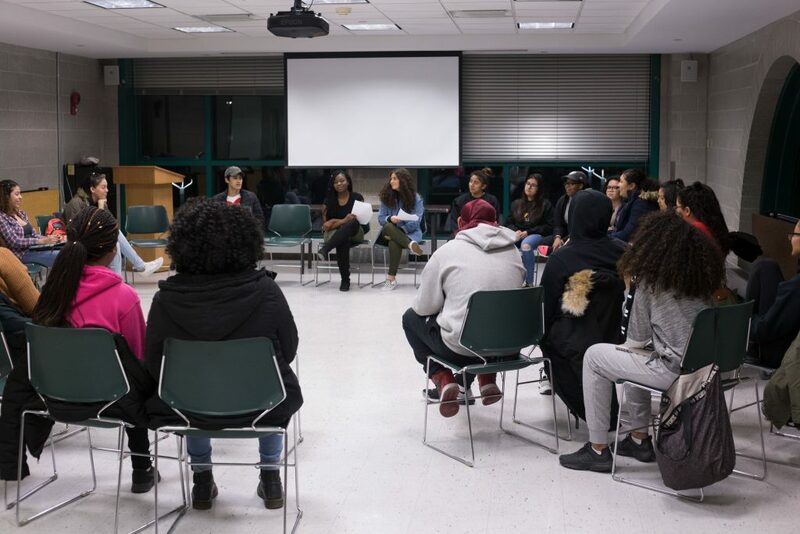 For executive board members at JUMP Nation, a student-run nonprofit that aims to support at-risk students and tackle obstacles such as drugs and domestic issues, Wednesday’s talk served as an important way to highlight the real-life implications of the differences in expenses between men and women. According to Ryan Paulino, part of the mentoring committee at JUMP Nation and a junior majoring in systems science and industrial engineering, discussing the pink tax also leads to an exploration of the inequalities women are facing in their day-to-day lives. The pink tax also applies to feminine hygiene products, such as pads and tampons, which are subject to sales tax because they are considered luxury goods and not a necessity. New York is one of only nine states across the country that exempts feminine hygiene products from sales tax. Last Monday, Gov. Andrew Cuomo announced on Twitter that New York schools will now be required to provide free menstrual products for girls in grades six through 12. “Menstrual products are as necessary as toilet paper and soap, but can be one expense too many for struggling families,” Cuomo wrote. According to Noel Feik, executive director of health and counseling services at Binghamton University, different resources at BU also provide free menstrual hygiene products for students. Shamika Fingall, secretary of JUMP Nation and a junior majoring in integrative neuroscience, said she hopes to encourage students to eliminate the pink tax by talking with them about the issue. Brianna Johnson, a sophomore double-majoring in human development and sociology, said she came to JUMP Nation’s meeting without any prior knowledge of the pink tax, but left with a new perspective.